Artist daughter @dinoraye has appropriated the Yiynova MVP-22U (v2) and agreed to model the new drawing glove and pen in exchange. Kid drives a hard bargain. Anyone who’s ever made an online purchase from a vendor without a physical store has likely faced this doubt: how to trust the entity on the other side of the transaction? Add to that the risk of purchasing relatively expensive but little-known hardware imported directly from China by an internet reseller. Are your Spider senses tingling yet? 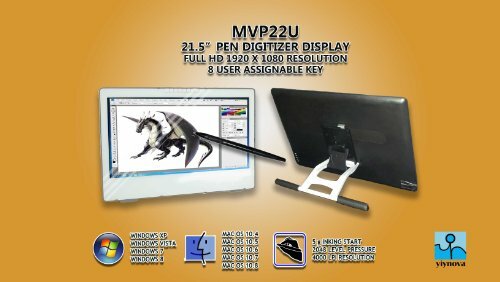 That was certainly how I felt last year, as I plunked down a cool $1K to purchase the Yiynova MVP22U (v2) tablet monitor from their U.S. distributor The Panda City. At the very least, I was able to take comfort in the fact that The Panda City has an Amazon storefront so worst case I could get a refund from Jeff Bezos if the product failed to show up or work as advertised. My fears were certainly justified when the first unit I received started acting up within days of the unboxing. But only a couple of hours after submitting an RMA request, The Panda City’s customer service person Vicki (I wonder if that’s her real name or a catch-all Americanized name for their support team?) arranged to send out a replacement. When it arrived at my door a week later, I just boxed up the defective unit and attached the pre-paid return label. Fast forward seven months and the second Yiynova monitor developed a similar problem (image flashing on and off). I gritted my teeth as I completed the RMA request form found on The Panda City website. Surely this time I’d have to send the monitor in for them to diagnose the issue and either fix or replace it. But within an hour of pressing send on my email, there was a response back from Vicki. She apologized profusely for the problem and told me a new monitor would be shipped via Fedex the following morning. And a week later, the new unit (sporting updated firmware) arrived at my doorstep. To top it off, inside were a pair of Yiynova artist’s gloves and a new pen as an apology for the down time. I guess I could be upset that two monitors have failed on me, but that’s an issue with Yiynova. Have any of you experienced similar issues with their products? Let us know in the comments section below. In the meantime, I choose to focus on the laudatory customer service I received from The Panda City. They and Vicki could have given me a hard time or expected me to send my monitor in first. Instead, they just took my word for it, expedited delivery and sent me a valuable bonus as well. (Cynics among you may wonder whether they merely offered me special treatment because of my blog’s reach. I don’t think that’s the case. I didn’t identify myself as SurfaceProArtist when I submitted the RMA request and this site’s reach was a tenth of its current size during the first incident late last year). Needless to say, The Panda City has earned a happy customer who looks forward to shopping from them again. Just imagine how much better our tech lives would be if most major vendors took such proactive care of their clientele? Newer:Penny Arcade's Gabe bails on the Surface Pro 3; UPDATE: Maybe just PhotoshopOlder:Lenovo ThinkVision LT1423p: The poor man's Cintiq?